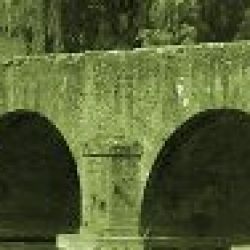 Chantal PARIS is enjoyed to welcome you at Le Pont Romain. Ideally located between Paris and Brittany, at the doorsteps of the Loire valley castles, near to Le Mans, l offer the incomparable charm of a French provincial family residence and the comfort of its bed & breakfast accomodations. 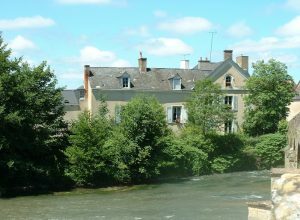 You will enjoy this peace haven, located in a park at the heart of a 1 hectare forest along of the river : l’Huisne, benefit to his park and his tranquility, for a weekend, a day or a week…. 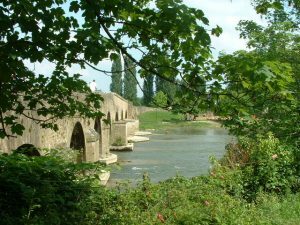 Close to the harmonious Pont Romain, this typical residence has a park of one hectare. In the small wing of the house you will find two comfortable suites. Old Furnishing, the refined linen and the quiet noise of Huisne river is the result of a peace haven. Same atmosphere in the large dining room where meals are served. The discrete servicing of Chantal Paris is added to the charm of her house which grew rich by two new rooms and a living room.